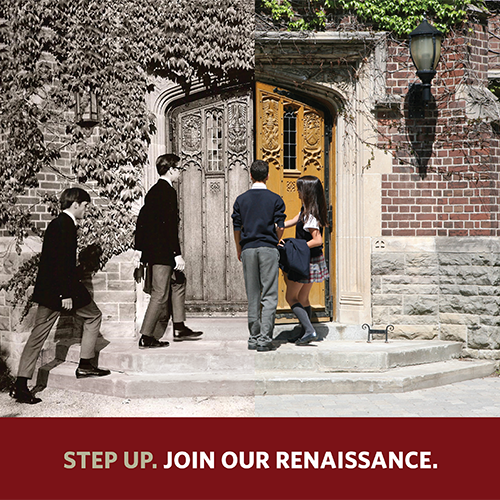 It has been a year since Trinity College School community members learned of the next phase of initiatives aimed at the preservation and enhancement of our beautiful campus with the launch of the TCS Renaissance Plan. The summer of 2018 saw the TCS Renaissance Plan in full swing with several short-term priority projects being addressed and completed. Projects that took shape over the summer included a new campus fire alarm system; phase one of a new campus storm and sanitary water system; enhancements to a few of the School’s older residences; and swimming pool electrical upgrades. Of particular note, extending into the fall months, the installation of the new fire alarm system was a large initiative involving the replacement of every fire panel and its associated peripheral devices across the campus, with the exception the athletic centre which had a new system installed during its recent construction. The School’s new modernized fire alarm system installation wrapped up at the end of 2018 with final testing happening over the Christmas break. To read more about these summer 2018 projects, click here. To view a photo gallery of these initiatives, click here. The oldest of the School’s boarding houses, Brent, Bethune and Bickle House, benefitted from some summer renovations which involved the replacement of the north washrooms on the first, second and third floors of Brent; the construction of a new residence room in Bethune; and the addition of an enhanced parking lot and circular driveway in front of Bickle House. New initiatives, soon to be underway, and thanks to the support of donors to the “Friends of Bethune” campaign, the Bethune washrooms will be renovated during the summer of 2019. Bethune will also receive a new third-floor study and a student kitchenette on the second floor. The home of the Junior School, Boulden House, will see renovations in the Grade 5 and 6 classrooms including fresh paint, new ceilings and electrical enhancements including LED lighting. A new, permanent, dehumidifier system will also be installed in the basement to better regulate climate in Boulden House. The School’s two aging steam boilers, that heat all buildings stretching from the W.A. Johnson Classroom Block to Ketchum House, will be replaced with three new and more efficient boilers. Construction required to accommodate the new boilers is expected to commence this coming March. The replacement of the School’s storm and sanitary water lines remains the project with the largest scope. Phase one of this project took place last summer and involved the digging of deep trenches around several of the campus buildings in order to gain access and replace the existing lines. Phase two will begin on Ward Street this May and will extend onto the main campus over the summer months (in order to avoid impacting campus activities during the academic year). This extensive storm and sanitary water line replacement will require extensive excavation of the front terraces as well as near W.A. Johnson Classroom Block and Ketchum House. While these projects have been prioritized to commence this year, there are many other projects aimed at renewing and restoring campus facilities and infrastructure which the School aims to begin once funds become available. The School expects to complete approximately $10 million in campus improvements by 2020, with a projected total cost in excess of $38 million by 2032. As a school, we are committed to a process of continual improvement. In our role as caretakers for future generations of Trinity College School students, we are laying the foundation for the long-term sustainability of our campus. Through the initiatives of the TCS Renaissance Plan, today’s TCS community will honour the great TCS tradition of ensuring the future of this school for future generations. For more information, please visit: www.tcs.on.ca/renaissanceplan.